The second-ranked Nebraska volleyball team opened its 2018 season with a hard-fought 3-1 loss to No. 7 Florida Friday night in front of 8,435 fans at the Bob Devaney Sports Center. The rematch of the 2017 National Championship Match was decided by a total of just eight total points. Florida took the first two sets, Nebraska won the third, 25-23, and Florida closed out the match with a 25-23 win in the fourth set. 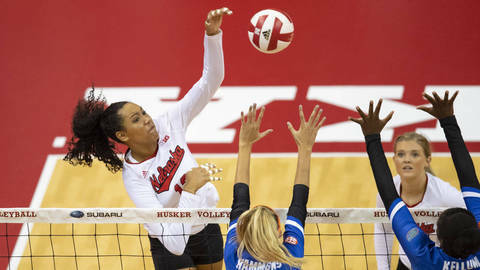 The loss snapped Nebraska’s 30-match home winning streak and seven-match winning streak against top-10 opponents. Florida (1-0) was led by freshman Thayer Hall, who totaled 20 kills on 60 swings in her first career match. She was the only Gator in double-figure kills, as both teams had 49 kills in the match. Florida out-blocked Nebraska, 10.0-9.5, while the Huskers out-dug the Gators 65-59. Nebraska held a talented Florida offense to .182 hitting, but the Huskers’ 43 combined attack and service errors were too much to overcome against a physical Gator lineup.